Community pharmacy should be included "in any plan to rejuvenate our high streets", the NPA has said in response to yesterday’s budget announcement of a "future high street fund". The Future High Streets Fund of £675 million will include “a high streets taskforce to support local leadership, and funding to strengthen community assets”, the Treasury said in its autumn budget. It suggested bids from local authorities for this money could include investment in infrastructure, or local transport. In his budget announcement yesterday (October 29), chancellor Philip Hammond also confirmed that the budget for NHS England will increase by £20.5 billion a year for the next five years. Mr Hammond remained tight-lipped on whether community pharmacy would receive a share of either of these funds, and Gareth Jones, National Pharmacy Association (NPA) head of corporate affairs said the government may have missed a trick by ignoring the sector’s potential. “Long-term, we need to think more creatively and recognise community pharmacy’s social capital in any plan to rejuvenate our high streets,” Mr Jones said. “Local pharmacies are a valued community asset, ranked second only to the local GP surgery as an essential high street service. “They are a delivery point for primary healthcare, a driver of economic growth and a healthy neighbour on an increasingly unhealthy high street,” he added. Mr Jones said contractors would welcome the news that business rates will be cut by a third for ‘small retailers’ – those with a “rateable value” of £51,000 and under. “However, the cut has to be considered against last year’s business rates hike that affected many of our members,” he stressed. Pharmaceutical Services Negotiating Committee (PSNC) chief executive Simon Dukes said he is “pleased” to see the funding to transform local high streets, as “community pharmacies can provide a focal point for high streets, offering local communities a range of services that can help them stay healthy and manage any conditions”. While “little detail about future health funding was revealed… it is clear that prevention, and how we can reduce demand for services and help people to live longer, healthier lives, remains a key focus”, he added. “Community pharmacies have the potential to contribute much of value in this area, acting as health and wellbeing hubs on local high streets, and we will continue strongly to make the case for that,” Mr Dukes said. Royal Pharmaceutical Society (RPS) English board chair Sandra Gidley said the extra NHS funding should be spent on “supporting public health and prevention, investing in education and training, and ensuring patients and the NHS receive the most benefit from medicines”. The £2bn additional investment in mental health services – which Mr Hammond announced as a “sneak preview” of his NHS 10-year plan – is welcome, “but this should also be targeted at support for people before they reach crisis point”, Ms Gidley added. "As the third largest health profession, pharmacists working across the NHS can play a key role in closing the gap between people’s physical and mental health." As part of his autumn budget, Mr Hammond also announced an additional £500m for 2019-20, to help government departments prepare for the possibility of a ‘no deal’ Brexit. How much each department will be allocated will be announced “in the coming weeks”, Mr Hammond said. Mr Hammond also announced in his budget an additional £240m in 2018-19 and £240m in 2019-20 for adult social care. “The government will also ensure that public health services help people live longer, healthier lives,” it added, promising that budgets for this will be confirmed next year. Have budget cuts affected your pharmacy in the last 12 months? Is the picture different in Scotland, Northern Ireland and Wales? 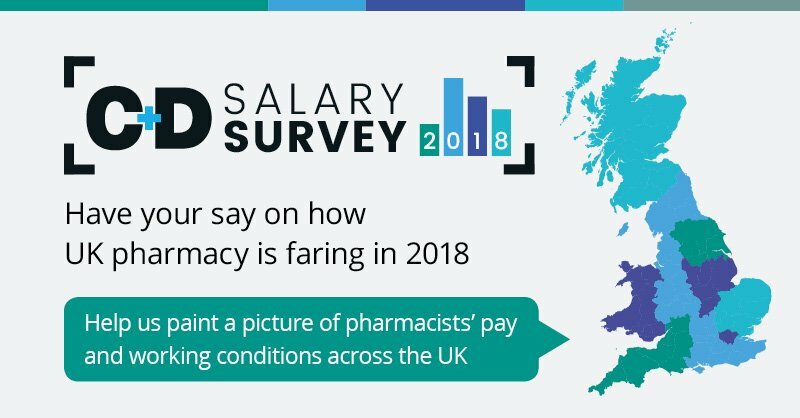 Take the C+D Salary Survey and tell us how community pharmacy across the UK is faring – complete the survey here. Is your pharmacy situated on a high street?